Due to a high volume of work, we are currently looking to hire a project actuary with excellent financial reporting experience and prophet knowledge. 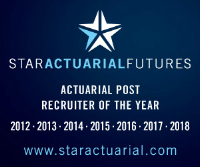 You will be joining a team of project actuaries where we will be looking for you to model, analyse and explain. Financial reporting of business profitability and value across a range of metrics. Develop detailed understanding of the prophet model, data, assumptions and associated Manual calculations use to project business value. Detailed reports explaining reconciling MCEV, Regulatory results and IFRS adjustments. Ensure project deliverables are accurate and to a high standard. Experience of drafting technical actuarial papers and challenge current practise in order to drive improvement. Experience of preparation of reports, analysis, commentary and technical actuarial iopinions on financial reporting matters.